The images are so much fun- mainly as they are so stylised- but that is what I like about them. Motifs were repeated across the width or just solo, and I love the idea of embellishing them with a bow on a cat or a pom pom on a bunny tail. How gorgeous is the middle boy?! And you can not go wrong with a nautical theme. We have looked at loads of old 40's and 50's patterns and made our own motifs which will be knitted into our new projects. Can't wait to get knitting them! Here at Bobble we are busy working on new products to sell online. In the meantime I can't help but pick up new projects that get flung at me- here are a couple of recent ones. I just can't say no! This is my baseball style cardigan for a baby. It is based on a 1950's vintage pattern which I then amended. So, I used the same pattern as the cardigan above but with stripes and a couple of pompoms...and here she is! This is a 2-tone fairisle pink and blue striped cardi; the cherry on the cake is the 2 pompoms on her shoulders. Apparently they have been a big hit with her fans. I like how one cardi pattern can look so different depending on the details. Greetings! We are delighted to say that we have our beautiful baby bobble hats for sale online. We have launched this website with a small but colourful collection of baby hats. Later this year, more exciting new products and ranges for little ones will be added. Please have a look at our shop; if you would like some colours that you can't see, we will arrange for one of our elves to knit one up. Thanks to everyone who made it out to the market at the weekend (especially those of you who bought hats from Bobble!) - we hope you managed to tick a few more things off of your Christmas shopping lists. 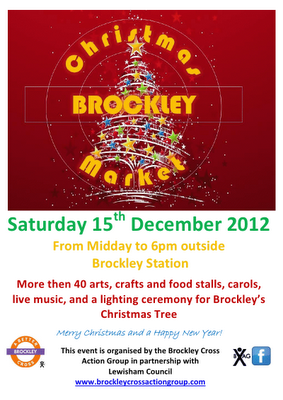 You'll be able to find a nice selection of our baby hats for sale at the Brockley Christmas market in South East London, on Saturday December 15th, so come along - they make great Christmas presents.